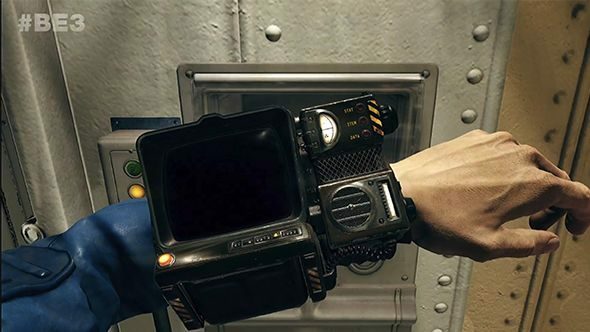 Fallout 76 will have a brand-new Pip-Boy. A trailer from Bethesda’s E3 conference showed an updated version of Fallout fans’ favourite personal portable computer. Well, I say updated, but if we’re going to get technical about things, it’s actually an old Pip-Boy. Since Fallout 76 is a prequel, it takes places centuries before the rest of the games in the series. What that means is that the Pip-Boy from that trailer (which you can take a look at in the image at the top of this article) is actually a lower-tech version. We got to see plenty of new role-playing games from Bethesda last night, but which is the best RPG? It’ll be interesting to see how the Pip-Boy works in the new game – given that Fallout 76 is “entirely online” (according to executive director Todd Howard), I doubt it’ll be used in exactly the same way that you’ll be used to if you’re a fan of the tradition single-player RPGs. In those games, it’s a map, a quest tracker, a radio, and even a light. It’s entirely possible that those features will return, but expect to see them tweaked for online play, at the very least. The Fallout 76 release date is November 14, 2018. If you’re into your new RPG announcements, you may be interested to know that The Elder Scrolls VI was officially revealed last night. Don’t expect to see it for a few years yet, but take comfort in the fact that it does actually exist.